Every year around Nov. 1, many host a get together to honor loved ones who have passed. It’s not a somber, sad occasion, though. It’s a festive celebration known in the Latin American culture as El Dia de los Muertos or the Day of the Dead. El Dia de los Muertos lasts for two days and is often associated with Halloween, although the holidays have separate origins. During Halloween, images of ghosts and skeletons are meant to scare people. Those who celebrate el Dia de los Muertos, on the other hand, colorfully decorate images of skeletons and skulls and display them as a way to make everyone feel more comfortable with death. Mexico's indigenous people began what is now known as El Dia de los Muertos thousands of years ago. Roman Catholic settlers in Latin America influenced the tradition over time, and it now coincides with the Catholic celebrations of All Saint’s Day on Nov. 1 and All Soul’s Day on Nov. 2. Some believe that it’s easier to communicate with the souls of the dead on those days, so they visit cemeteries, decorate tombstones and set up altars to honor loved ones who have passed. Traditionally, deceased children are honored on Nov. 1, and deceased adults are honored on Nov. 2. Decorate your home with flowers, including marigolds, which are believed to attract the souls of the deceased. If you can’t fill a room with fresh flowers, make tissue-paper flowers with your children before or during the party and display those instead. Hang images of skeletons and skulls. Use a skull template for a variety of crafts, such as making masks with the kids or using it to dust powdered sugar in the shape of a skull on top of a chocolate cake. To do the latter project, trace one of the skulls in the middle of a larger piece of paper, cut out the skull leaving the paper that surrounds it and place that negative image on top of the cake. Cut out the skull’s facial features and place those on the cake where they would appear on the skull’s face. Gently dust powdered sugar on visible part of the cake using a flour sifter and then carefully lift off the paper pieces to reveal the skull. Set up an altar and decorate it with crosses, candles, flowers, photos of the deceased and offerings, such as the favorite foods of those who have passed. Make and wear shell bracelets, the noise from which is believed to wake up the dead. Serve traditional Dia de los Muertos food, such as sugared skulls, pan de muerto and tamales. Tell funny stories about the deceased. 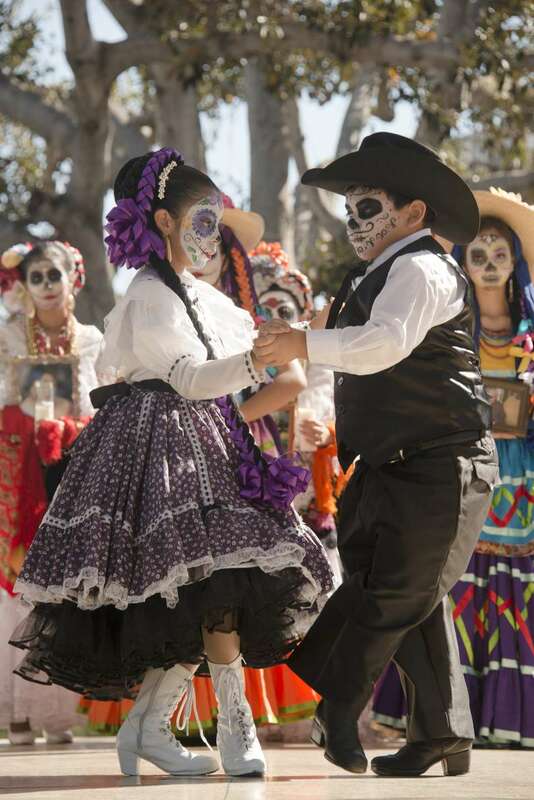 At annual parties, children make crafts, such as bracelets made from skull beads, and are given Dia de los Muertos stickers and coloring books for winning at freeze dancing or wearing the best costume. Children are taught to think of happy memories of the people who have passed and to “celebrate the dead to remember to live more.” The saying they live by is ‘Don’t fear dying. Fear not having lived. What Can You and Your Child Explore and Celebrate in November? What Steps Should I Take to Hold an Oktoberfest Party?